If you read my blog regularly, you know that I’m not a fan of preview parties. But since I have to attend many of them, I know the good ones. So how does the Merchandise Mart preview compare? Very well, thank you. The food was generous and very tasty, the bars well-stocked and unlimited. So, if I must attend a preview party, at least let it be a good one. I’m optimistic that business will be good at this show. The antiques market is quite solid at the moment, based on business at shows, but more importantly at auctions. The auction business has been really solid for quite a while. The Mart show ends on Monday, so I’ll post results on Tuesday or Wednesday of next week. I’ve taken a lot of time to add new items to my website. Please take a look, as every day I’m adding more. Click on this link chasenantiques.com. 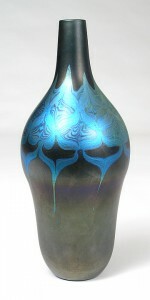 Rago Arts held their 20th Century auction this past Saturday, April 24, 2010, with good results for pottery, furniture and glass, as well as a few exceptional results. In an email reply to my inquiry, David made the following remarks about his sale. “As for the ac sale, the low estimate was 690k and the sale hammered at 718k. it was 88% sold at the hammer (with things selling after the sale, as always). Better things did better, which I’m sure comes as no surprise. The market is really expressing a discerning eye and the bottom end of most things has really fallen away. The tiffany that either didn’t sell or attracted little interest were the obviously weak lots. If I never see another acorn table lamp again I’ll be thrilled. Unless the background glass is red. And the base is decorated with mosaic tiles. And the reserve is $5k. 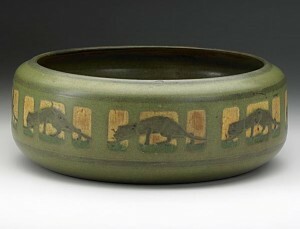 The first lot of the sale was a Marblehead bowl, with rare panther decoration. It carried a pre-sale estimate of $25-35,000. 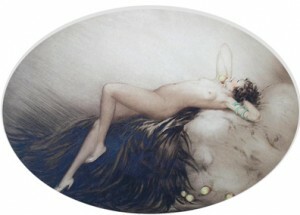 The result doubled the low estimate, with the bowl selling for $61,000, including buyer’s premium. There weren’t many Tiffany lots in the sale, but for the most part, they did very well. 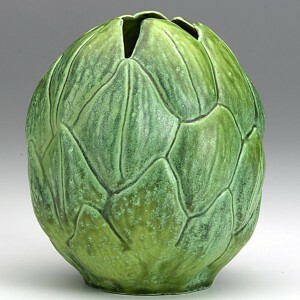 A rare 6″ tall pottery vase, in the form of an artichoke, sold for $19,520, approximately double the high estimate. 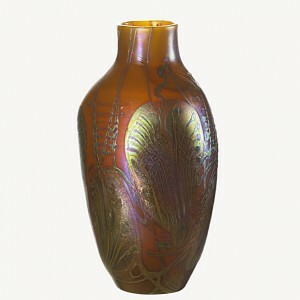 Lot 272 was a Tiffany Favrile 9″ vase with elaborate gold hearts & vines decoration on a deep carmel background. The vase sold for $26,840, approximately four times the pre-sale estimate — a surprising result. Perhaps the hint of red was the reason for the enthusiasm. For the complete auction results, click on the following link Rago Early 20th Century auction results. The Los Angeles Antiques Show is a small, but very upscale show, with a high percentage of European dealers, some of whom were really impacted by the travel ban caused by the smoke from the Icelandic volcano. A couple of the dealers set up fantastic booths, that had to cost tens of thousands of dollars, especially coming from Europe. I wish I knew how they fared. The show started off slowly on Wednesday night, with the usual preview party — many guests, very few sales. Opening day attendance on Thursday was poor, which was surprising. Friday was quite slow too, but that’s usual for a four-day show. I was told that attendance and business would pick up on the weekend and it did. Saturday was a decent day, but far from a barnburner. Attendance on Sunday was moderate, with commensurate sales. Overall, the show was decent, with interest across the board from Tiffany to Icart to Grueby pottery. As the show is a big investment in resources and time, I’m not sure I’m willing to try it again. I’ll make that decision later. Why do antique shows have preview parties? I don’t understand why fancier antique shows have preview parties. They are an enigma to me. Apparently show promoters feel they’re important. Perhaps if a show has the support of a non-profit organization, it will benefit the show. I just don’t see it. Let me try to analyze the different points of view. From a dealer’s point of view, I’m totally in the dark. For the most part, preview parties are a waste of a dealer’s time. Almost nobody is there to look at antiques, much less buy antiques, so the evening is spent drinking (that part’s not bad) and scrounging for food. It depends on the show, so sometimes there’s plenty of food and other times not. At some shows, a box with a half sandwich and a couple of cookies is handed out to the dealers for dinner. What??? Give me a break — that’s insulting. From the attendee’s point of view, it’s a fun night out. See and be seen. Eat, drink and be merry. Why not? 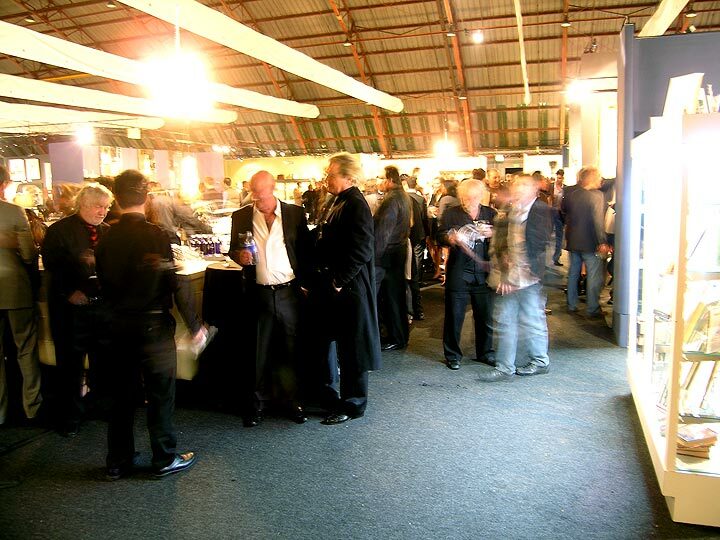 Attend an elegant social event, get fed, drink and have a great time. This part I understand. My biggest problem is with the promoter’s point of view. I guess they’re trying to give the show a certain cachet. But is that really what they’re accomplishing? I don’t think so. Whether the show benefits a zoo or a children’s charity doesn’t seem to have any impact whatsoever on the success of the show. A show’s success is measured by other criteria. Is the paid attendance excellent? Are the dealers selling well? Is there a waiting list of dealers who are trying to get into the show? 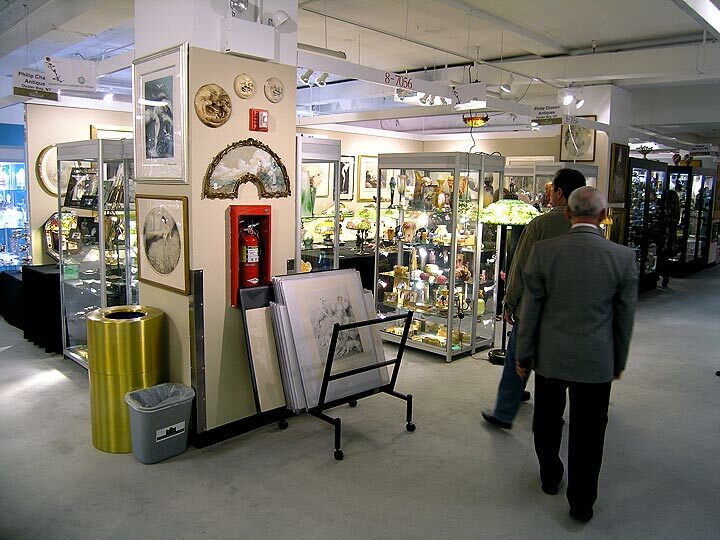 Some of the most successful antique shows in the country do not have preview parties and are doing great — the New York City Pier Show, the Baltimore Summer Antiques Show, the Miami Beach Convention Center Antiques Show. So if a preview party doesn’t seem to have much, if any, effect on these criteria, why have them? Have I ranted enough yet about preview parties? I wish they would go away and promoters would get down to the business of running high quality shows that the public wants to attend. 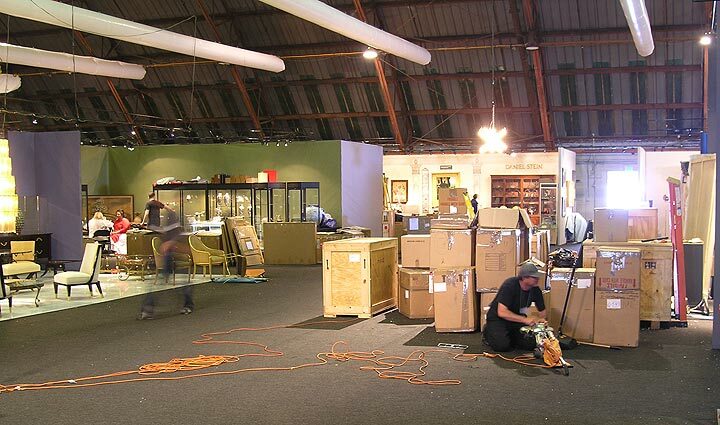 I’ll post the results of the Los Angeles Antiques Show on Monday or Tuesday. I’ve never before exhibited at the Los Angeles Antiques Show at the Barker Hangar. It’s an interesting building — corrugated tin exterior with an arched roof. It’s not a huge building, so the shows there aren’t very big, but there is a nice feeling of intimacy. My booth is a big mess, but it will be beautiful by the time the show opens. The level of the dealers and merchandise at this show is very high, with more than a few foreign dealers, especially from England. The problem this year is that some of the English dealers are stuck in England because of the flight ban caused by the Icelandic volcano eruption. I really feel for them because I was in a similar situation this winter. Some of you may recall that I was prevented from flying to the Palm Beach Antiques Show because of a severe snowstorm in the northeast. The difference is that I had an option — I could drive through the storm. Unfortunately, the English dealers have no other options. There’s a possibility they might arrive in time for most of the show, but that’s yet to be determined. The main aisle will look a lot different by Wednesday evening's preview party. It’s a pleasure to exhibit at shows at this level. One of the dealers spent the whole day having a custom wood floor installed in his booth, as well as 150 spotlights. He’ll have a gorgeous booth at the end of the day, but I hope his sales are good enough to cover his expenses. The show gets underway on Wednesday night, with a preview party — always my favorite. NOT! They’re usually a waste of a dealer’s time, but one never knows. Maybe I’ll sell a few things and change my attitude. I’m not optimistic about the preview party, but I’d loved to be proved wrong. 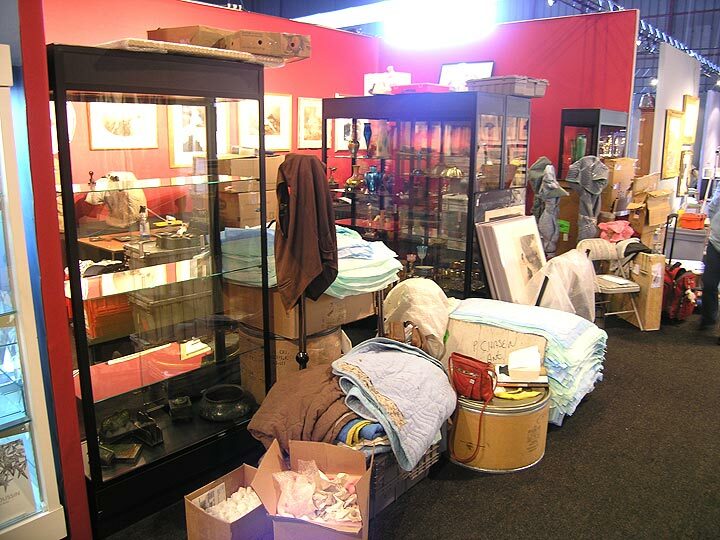 The 15th Annual Los Angeles Antiques Show will be held next week, April 21-25, 2010, at the Barker Hangar at the Santa Monica Air Center. The show has developed a reputation as the finest show in the greater Los Angeles area. What the show lacks in size, it makes up for in quality. The list of exhibitors is impressive, with a few new big names, including Bernard Steinitz of Paris, specializing in 17th to 19th century European furniture and decorative arts. London dealers are also well-represented in the show, making it truly an international event. I once railed about the lack of a singular important show in the greater Los Angeles area, and was told by a client, that this is the one. The quality will be ultra-high and the merchandise vetted, insuring that the public will be treated to a special event. This will be my first time exhibiting there and I’m excited about the prospect. It’s difficult to get the right people to attend a show in the Los Angeles area, so a special show is what’s needed, and this one fills the bill. The notable list of supporters of the show includes celebrities David Arquette, Courteney Cox and Tobey Maguire. 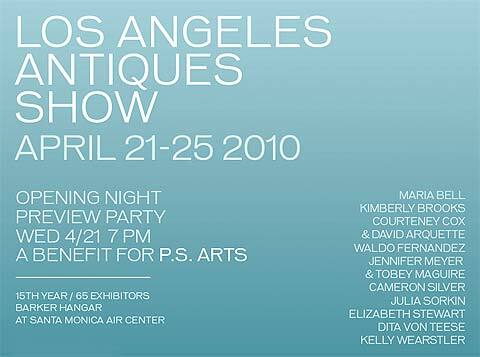 The Los Angeles Antiques Show is open to the general public from April 22-25, 2010. Show hours are Thursday, Friday, and Saturday from 11 a.m. to 7 p.m.; and Sunday 11 a.m. to 5 p.m. Admission is $15 and includes return entry and show catalog. Look for my post on the results of the show on Monday or Tuesday, April 26 or 27. I’ve got my fingers crossed it will be a rave review. 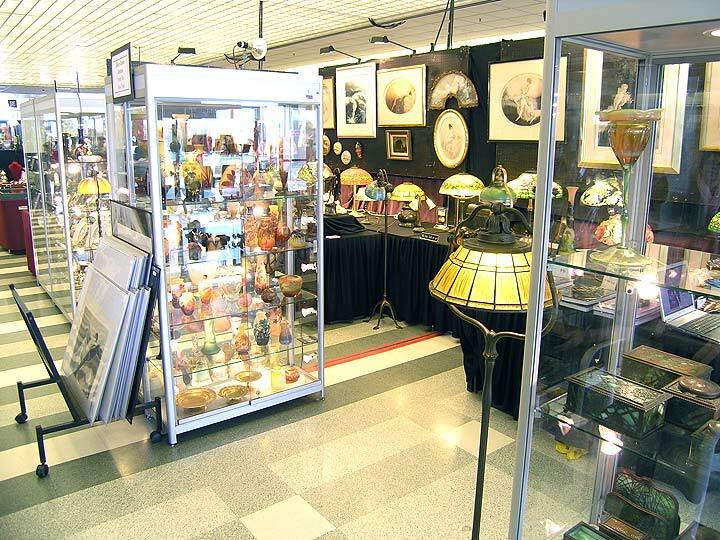 The Arlington Racetrack Antiques Show was held this past weekend in Arlington Heights, IL, a suburb of Chicago. It’s a small show that unfortunately has been getting smaller as time goes by. Shawn Hastings is the new promoter, having bought the show from Rosemary Krieger of Dolphin Promotions. 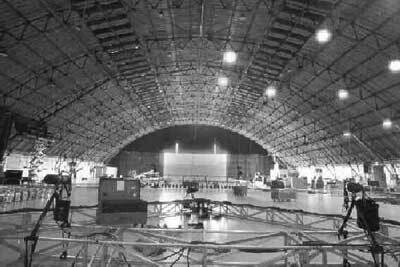 The show used to occupy the entire first level of the racetrack, as well as a small area on the second floor. Now the show occupies approximately 50% of the original space, and that’s too bad. Real collectors show up for this show, so I would think that the show would stabilize or grow. 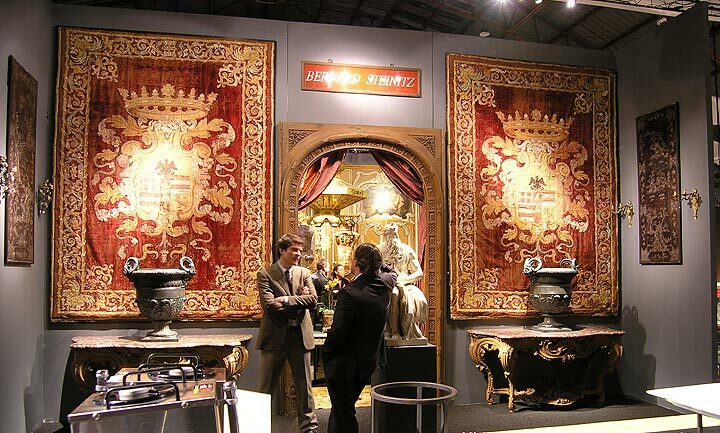 If dealers do well at a show, the word gets around and other dealers want to exhibit there. It starts a beneficial cycle, where more dealers exhibit and more attendees come and the show gets better and better. I’ll start the ball rolling and see if I can facilitate it. I spoke to many dealers at the show and asked how they did. Almost to a person, everyone said they had a good to outstanding show. One dealer told me he had his best Arlington show ever. Not one single dealer told me he had a poor show. That’s the kind of news everyone likes to hear. It means there’s no more talk of recession and no negativity. The new management increased the advertising budget to include television, and that’s always good. Attendance at the show was only moderate, but the right people showed up. On a personal level, I would like to thank all of my loyal clients, some of whom I’ve had the pleasure of knowing for twenty years. Most of my business was to these clients, which on one hand is great, but on the other, gets me nervous. Thank you, thank you. You know who you are. I always need new clients. There were some, but not enough. 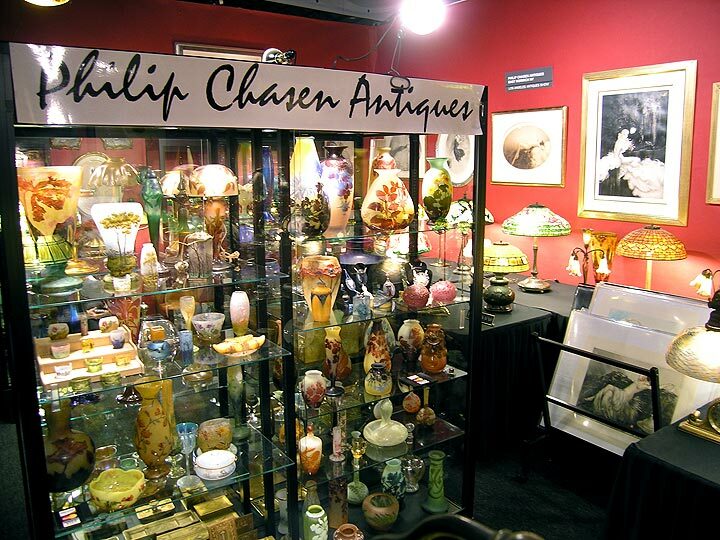 Interest at the show was strongest in Tiffany Favrile glass and French cameo glass. I’m looking forward to two super shows in a couple of weeks, the Los Angeles Antiques Show at the Barker Hangar in Santa Monica, April 22 to April 25, and the Chicago Merchandise Mart International Antiques Show, April 30 to May 3. More on those in future blog posts. It’s difficult to find a high quality, diverse auction nowadays, as auctions have become more and more specialized. Cottone Auctions put together a fabulous sale on March 27, 2010 and got the results to go with it. Geneseo, New York, is a rural town in the northwest section of the state. One would think it would be difficult to get high-quality, fresh goods in that area. But guess what? They’re doing it. Apparently upstate New York, which includes Buffalo and Rochester, is fertile territory for great consignments. The sale included great paintings, Tiffany, Handel, Duffner & Kimberley lamps, French cameo glass, Imperial Russia china, silver, furniture and more. The top lot of the sale was an 18th century Gilbert Stuart portrait of George Washington, that closely resembles the Stuart portrait of Washington that hangs in the National Gallery of Art in Washington, DC. The painting was in undisturbed original condition and came with impeccable provenance. The bidding started at $250,000 and ended at $1.06 million, with a west coast bidder on the phone losing to a Pennsylvania dealer on the floor. The top Tiffany lamp at the sale was a Magnolia floor lamp that descended in the family of Merton Armstrong, co-founder of the Sterling Alarm Company. Some of Armstrong’s lamps were purchased directly from Tiffany Studios in the 1920s and ’30s. The lamp sold for $661,250 — not a record for a magnolia lamp, but very respectable. A very good 20″ Dragonfly, on a great lily pad base, sold for $172,500, in large part due to the rarity and desirability of the base. Click this link for some of the highlights of the auction. Cottone Auctions. Remember to come see me this week if you’re in the greater Chicago area. 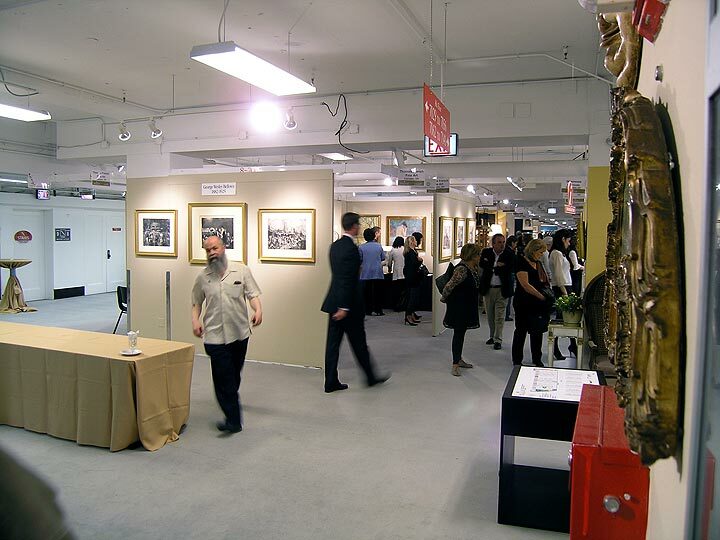 I’m exhibiting at the Arlington Park Racetrack Antiques Show, Friday-Sunday, April 9-11, 2010. You won’t believe all the great things I’m bringing. Many times I write about antique shows or auctions, but occasionally I like to teach. I taught in the NYC public schools for over eight years in the 1970s, so I guess I still have the teacher in me. 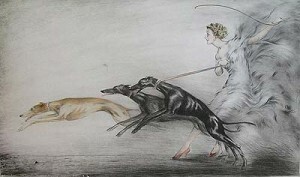 As I specialize in the artwork of Louis Icart, I often write about him. In order to better understand today’s topic, I’ll give a brief refresher course on the process of etching. The artist starts with a copper plate and uses a combination of drypoint etching tools, and/or acid, to create the artwork directly on the plate. The plate is then hand-inked and covered with a sheet of paper. 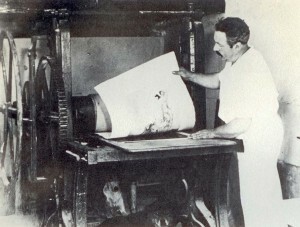 Together they pass through an etching press that applies tremendous pressure and transfers the image to the paper. If the etching is colorful, the plate is inked again with different colors, and the same sheet is passed through the press again. Registration of the paper is accomplished with tiny pinholes that align the colors. Manipulation of the ink when it’s wet (with wooden tools) is also done to achieve different effects. 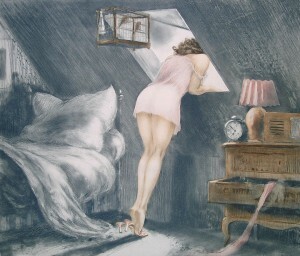 The result is that even though the artwork is the same on the plate, the final etchings can and do differ. 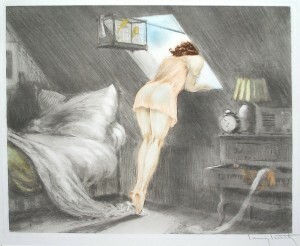 Above are two images of the Icart etching “Attic Room”. This is one that Icart intentionally issued in a variety of color combinations. Notice the completely different colors in her dress, the birds, the lampshade, the walls, the dresser, etc. 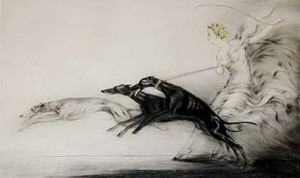 In an extraordinary example, Icart produced a one-of-a-kind color variation of the 1927 etching “Speed”. He gave this as a gift to his daughter, Reine, with a hand-written notation on the etching. Notice the beige dog in the front and the red shoes. To my knowledge, no one has ever seen another example of this variation. 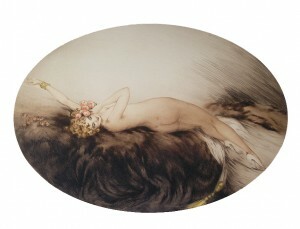 For a nearly complete list of the Louis Icart etchings I have for sale, please click on the following link. Icart etchings for sale. I’m taking a lot of time to add new items to my website. 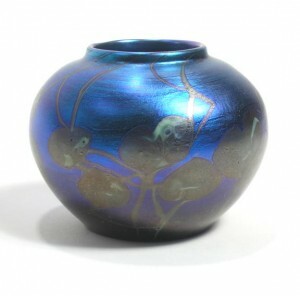 In the last few days I’ve added to the Gallé glass listings. Please take a look, as every day I’m adding more. Click on this link chasenantiques.com.